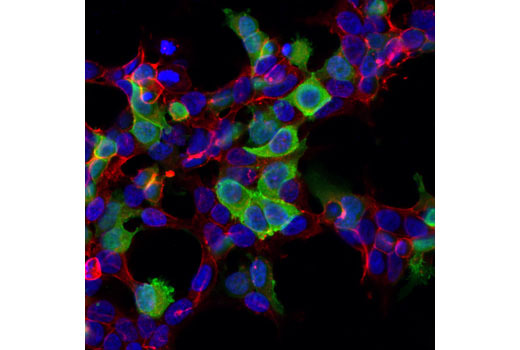 Confocal immunofluorescent analysis of 293T cells transfected with a His-Tagged protein using His-Tag (D3I1O) XP® Rabbit mAb (Alexa Fluor® 488 Conjugate) (green). Actin filaments were labeled with DyLight™ 554 Phalloidin #13054 (red). Blue pseudocolor= DRAQ5® #4084 (fluorescent DNA dye). Flow cytometric analysis of 293T cells, untransfected (blue) or transfected with a His-Myc-Akt plasmid (green), using His-Tag (D3I1O) XP® Rabbit mAb (Alexa Fluor® 488 Conjugate). His-Tag (D3I1O) XP® Rabbit mAb (Alexa Fluor® 488 Conjugate) recognizes recombinant proteins containing the 6xHis epitope tag. The antibody recognizes the 6xHis-tag fused to either the amino or carboxy terminus of targeted proteins in transfected cells. Monoclonal antibody is produced by immunizing animals with a synthetic peptide corresponding to residues of the 6xHis epitope tag.